Bob Allen's six westerns for independent producer Larry Darmour (see previous column) had only a mild effect on the B-western boxoffice. After six, Darmour replaced him with Jack Luden. 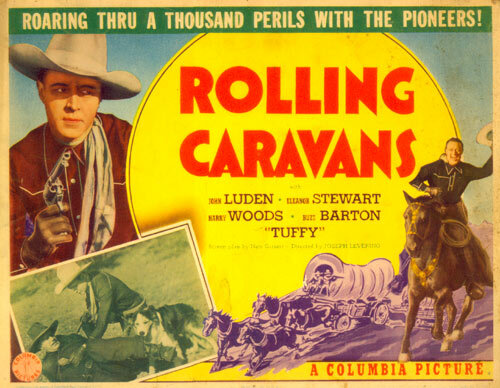 ROLLING CARAVANS (‘38 Columbia). In the first of Luden’s short four film series he’s saddled with operating a dummy (a task better left to Max Terhune) and quoting Shakespeare as he helps settlers ward off prairie raiders. 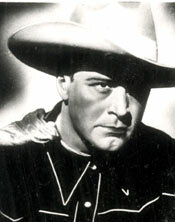 Jack’s sidekicks are the unlikely pair of Bud Osborne (misspelled Osbourne on screen) and Cactus Mack, both usually cast as owlhoots, and Tuffy the dog—who nearly steals the picture untying ropes, stopping runaway wagon teams, leading Luden to his horse and tackling badman Harry Woods in the last reel. Woods earns his Top 10 B-Western Badman’s status by ambushing girls, killing fathers and—kicking dogs! 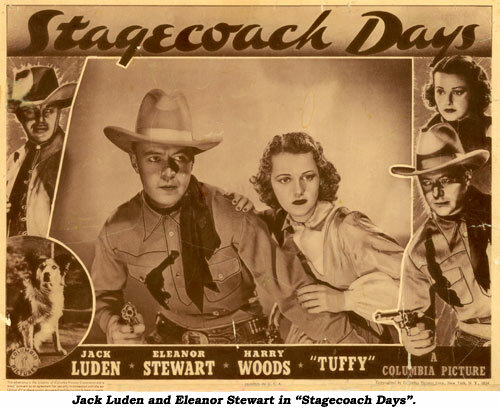 STAGECOACH DAYS (‘38 Columbia) To win government mail contracts, stagecoach lines held annual contests with the line making the best time from point to point being the victor. But some contestants resorted at times to cunning and violence…such as Harry Woods who goes after pretty Eleanor Stewart and cousin Luden’s line. Luden’s dog, Tuffy, eats meat off a fork, washes his dish, brings Luden his pipe and tobacco, retrieves a rope, ties badguys to a tree…he even plays the piano! All this serves to cover up the inadequacies of the ineffectual Luden, but makes for a very entertaining B-western. One huge continuity lapse occurs during the stagecoach race which starts out with only two competing lines but in stock footage there are three stages in the race. 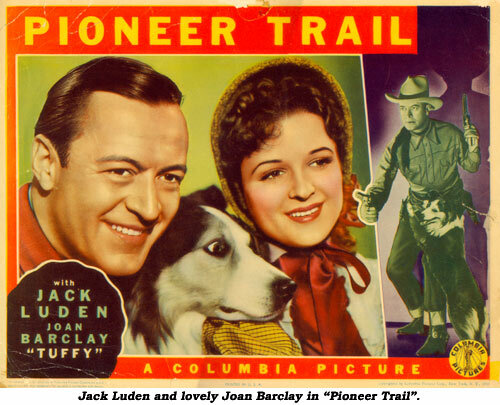 PIONEER TRAIL (‘38 Columbia) The film gets its two-star rating due to small border collie Tuffy and the outlaw Slim Whitaker/Marin Sais relationship, not from non-heroic Jack who’s roped and tied by outlaws and saved by Tuffy who also stops a run-away team. As Art Davis sings a “farm song”, Luden’s making silly faces and imitating donkeys, chickens, cows and turkeys. This bit would embarrass Max Terhune! Then Luden “plays a tune” on half-full drinking glasses! Not what we expect from our cowboy hero. More likeable is loutish old reprobate Slim Whitaker in his exchanges with his tough “old lady”, Marin Sais. Granted, Luden is a weak lead, but the film itself (filled with Ken Maynard stock footage), about rustlers along the opening of the Chisholm Trail is quite watchable. 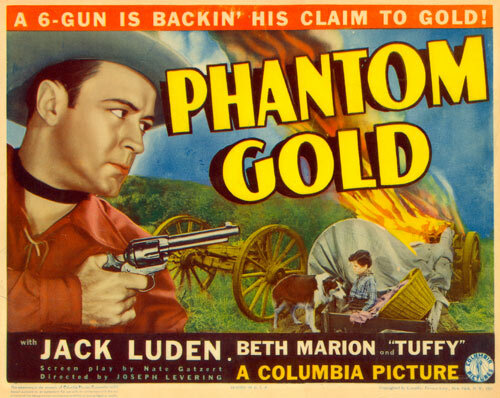 PHANTOM GOLD (‘38 Columbia) Luden’s B-western career was over practically before it started. Seemed like producer Darmour was getting farther and farther away from success until he next signed Gordon (Bill) Elliott to finish out the four remaining westerns he’d contracted to produce for Columbia. With Luden, Darmour had tried various approaches, in this one he tries a trio—Luden, singer Art Davis and black actor Jimmy Robinson as Pancake, which actually worked quite well and might have developed into something if given a chance. (Although it is kinda odd to watch Luden strumming a gee-tar while Art sings!) Luden and his pals find an orphan and his dog Tuffy on the prairie after outlaws wipe out his parents in a robbery. The outlaws scheme to start a phony gold rush to bring people and cash back to their ghost town by salting an old mine. Highlight of the film are the outrageous comical scenes between Slim Whitaker and Marin Sais. Luden, nephew of William Luden who founded the cough drop firm in 1881, ended up in San Quentin in ‘50 on possession of heroin. He died in prison in ‘51.